The flag of the city of Akabira is blue with mark. The city emblem was adopted on Dec 2nd 1966 but there is no flag law. The blue flag has a yellow city emblem in the center. The city emblem is a stylized kanji 赤 Aka of Akabira. The wings represent the city's future exponential development and the outer circle does the citizen’s concord, improvement and solidarity. The flag of the city of Ashibetsu is purple with mark. The city emblem was adopted on Jul 3rd 1948 by Notice No 19 but there is no flag law. The dark blue flag has a white city emblem in the center. The city emblem is a stylized kanji 芦 Ashi in the center surrounded by a circle of kanji 別 Betsu. The five pointed star is composed of five diamonds. The star stands for Hokkaido and the diamonds for coal. The circle represents the citizen’s solidarity and happiness. Ashibetsu city general affairs section says the color of the field is not purple but a dark blue. The flag of the city of Bibai is purple and white bicolor with mark. The city emblem was adopted on Sep 2nd 1950 and the flag was adopted on Jul 10th 1970. The purple flag has a black city emblem in a white semicircle with an orange thin line inside. The city emblem is a combination of a stylized hiragana ひ Hi with a mussel. The purple color and white color stand for River Ishikari,winds and snow and a frontier spirit, the orange color for hopeful citizen, an image of the city developing to the future and the black color for a black diamond = coal. The flag proportion is 2:3. The flag of the town of Chippubetsu is white with mark. The town emblem was adopted on Jun 1st 1968 but there is no flag law. The white flag has a blue and a yellow two color town emblem in the center. The town emblem is a stylized katakana チ Chi of Chippubetsu. The upper triangle symbolizes a land form of the town and a stability of the town people and an exponential development, the lower circle does a rice hull, love for home town and ex-legionary frontier spirit. Why is the frontier spirit specifically ex-legionary? In Hokkaido colonization office (1869-1882) promoted settlements of ex-legionary to develop wilderness area to work as a farmer and a army soldier. Most of municipalities in Hokkaido developed by ex-legionary still respect such frontier spirit. 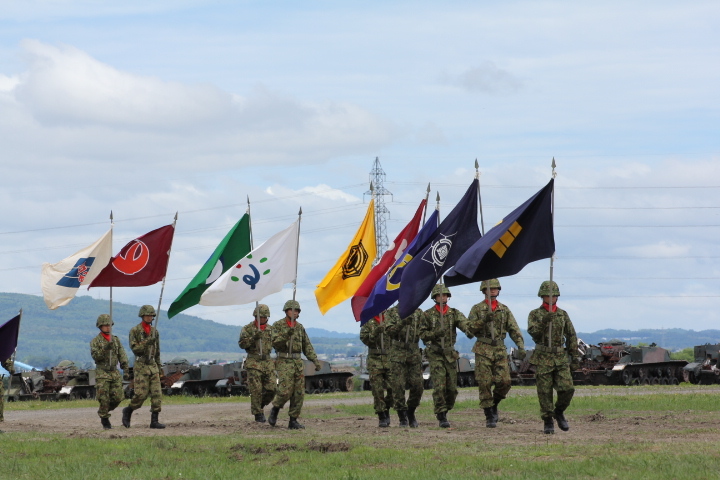 Hokkaido ex-legionary had their red flag with white zigzag line in the center. The flag of the city of Fukagawa is white with mark. The city emblem was adopted on Jul 16th 1963 but there is no flag law. The white flag has a blue city emblem in the center. The city emblem is a stylized katakana フカ Fuka of Fukagawa. It represents eternal peace, the citizen’s reconciliation and the exponential development of the city. The flag of the town of Hokuryu is purple with mark. The town emblem and the flag were adopted on Jul 23rd 1963. The purple flag has a white town emblem in the center. The town emblem is a stylized kanji 北 Hoku and H. The white part stands for a rice paddy as the agricultural base, the upper umbonal part for a mountain and the purple part for River Uryu and River Etaibetsu running thru the town. The flag proportion is 72: 94. The height of the emblem is 1/3 height of the flag. Thanks to Mr. Kariyasu here are corrected flags. The flag of the city of Iwamizawa is green with mark. The city emblem was adopted on Apr 1st 1948 and the flag was adopted on Jun 22nd 1968. The green flag has a dark green, a yellow and a white three color city emblem in the center. The city emblem is a stylized kanji 米 = rice in yellow in a dark green diamond with a white fimbriation. The diamond stands for a land form of Hokkaido, the white color for sparking waves and the green color for Ishikari Plain. The flag proportion is 2: 3. The height of the emblem is 3/5 height of the flag. The flag of the town of Kamisunagawa is white with mark. The town emblem was adopted on Jan 1st 1953 but there is no flag law. The white flag has a red , blue and a white three color town emblem in the center. The town emblem is a stylized kanji 上砂 in red with a white fimbriation Kamisuna of Kamisunagawa in a blue diamond. The three parallelograms represent a river. The flag of the former village of Kita was purple with mark. The village is now, from 2006, part of the city of Iwamizawa. The flag of the former town of Kurisawa was purple with mark. The town is now, from 2006, part of the city of Iwamizawa. The flag of the town of Kuriyama is white with mark. The town emblem was adopted on Jun 19th 1963 but there is no flag law. The white flag has a red town emblem in the center. The town emblem is a stylized hiragana く Ku of Kuriyama. It represents a development in the future. The flag of the city of Mikasa is green with mark. The city emblem was adopted on Mar 8th 1957 but there is no flag law. The green flag has a yellow city emblem in the center. The city emblem is a stylized kanji 三 Mi of Mikasa. The three circles symbolize the exponential development, the ends of the circle do a solidarity of the residents. The flag of the town of Moseushi is white with mark. The town emblem and the flag were adopted on Jun 15th 1968 by Notice No 22. The white flag has a green town emblem in the center. The town emblem is a stylized hiragana も Mo of Moseushi in a form of a rice stalk. The circle symbolizes a cooperation and an affiliation, the two horizontal lines do peace and the sharp edge of the triangle does a progress and a development. The flag proportion is 2: 3. The diameter of the emblem is 10/14 height of the flag. The flag of the town of Naie is maroon with mark. The town emblem was adopted on Mar 18th 1954 but there is no flag law. The maroon flag has a red town emblem in the center. The town emblem is a stylized katakana ナ Na of Naie. It represents a peace and a surge. The flag of the town of Naganuma is green with mark. The town emblem was adopted on Sep 12th 1967 by Ordinance No 2 but there is no flag law. The green flag has a white town emblem in the center. The town emblem is a stylized katakana ナガ Naga of Naganuma. The wings symbolize a development as a flying bird, the letter N in the center does a local speciality rice hull and the circle does the town’s solidarity, peace and happiness. The flag of the town of Nanporo is white with mark. The town emblem and the flag were adopted on Apr 25th 1979 by Ordinance No 9. The white flag has a red town emblem in the center. The town emblem is a stylized katakana old town name ミナミホロ Minamihoro in a circle. The emblem symbolizes the town’s land form surrounded by three rivers: River Yubari, River Chirtose and River Ishikari. It represents a stability of the town and a reconciliation of the town people. The flag proportion is 2: 3. The diameter of the emblem is 10/18 height of the flag. The flag of the town of Numata is maroon with mark. The town emblem was adopted on May 8th 1954 by Notice No 10 but there is no flag law. The maroon flag has a white town emblem in the center. The town emblem is a combination of a stylized katakana ヌマ and kanji 田 Ta. It represents a development of the town by the town people’s solidarity, reconciliation and cooperation. The flag of the town of Shintotsukawa is white with mark. The town emblem and the flag were adopted on Jun 18th 1998 by Ordinance No 32. The white flag has a black town emblem in the center. The town emblem is a stylized kanji 十 To of shinTotsukawa in a diamond form. The most town people relocated from Totsukawa village in Nara prefecture in Aug 1889 to Hokkaido to build villages. With the background they use the same emblem/flag as Totsukawa Village in Nara. The Japanese word of SHIN means a new. The flag proportion is 2:3. The height of the emblem is 11/20 height of the flag. The flag of the city of Sunagawa is maroon with mark. The city emblem was adopted on Jun 21st 1948 but there is no flag law. The maroon flag has a white city emblem in the center. The city emblem is a stylized hiragana す Su of Sunagawa. The center circle symbolizes a peaceful, a bright and a livable city and the horizontal line does the future development. The flag of the city of Takikawa is blue with mark. The city emblem and the flag were adopted on Apr 1st 1971 by Regulations No 2. The blue flag has a yellow city emblem in the center. The city emblem is a stylized kanji 川 Kawa of takiKawa. It represents the city was developed in the delta region between River Ishikari and River Sorachi. The blue color stands for the city blessed with water and the yellow color for the city of abundance. The flag proportion is 2:3. The height of the emblem is 3/5 height of the flag. The flag of the town of Tsukigata is purple with mark. The town emblem was adopted on Sep 30th 1940 but there is no flag law. The purple flag has a white town emblem in the center. The shade of the purple is one in the attached image. The town emblem is a stylized kanji 月 Tsuki of Tsukigata in six petals of snowflake. The snowflake symbolizes a patience and the circle does a reconciliation of the town people. Tsukigata Town General Affairs section says they use only a purple flag at the town hall building but don’t use a dark blue one. The flag of the town of Urausu is purple with mark. The town emblem was adopted on May 3rd 1968 but there is no flag law. The blueish purple flag has a white town emblem in the center. The town emblem is a stylized katakana ウラ Ura of Urausu. It represents an exponential development , an improvement,a happiness, a solidarity and a concord. The flag of the town of Uryu is blue with mark. The town emblem was adopted on Nov 3rd 1954 Instruction No 1 and the flag was adopted on Jun 23rd 1989 by Notice No 21. The dark blueish purple flag has a yellow town emblem in the center. The town emblem is two stylized katakana ウ U of Uryu. It represents the town people’s strong solidarity and the town promotion in the future. The flag proportion is 2: 3. The height of the emblem is 35/80 height of the flag. The city emblem was adopted on May 3rd 1973 but there is no flag law. The yellow flag has a black city emblem in the center. The city emblem is a stylized katakana ウタシナイ Utashinai in a black diamond. The flag of the city of Yubari is already reported, but I found more purple flag. The city emblem was adopted on Aug 2nd 1937 but there is no flag law. The dark purple flag has a black and a white two color city emblem in the center. The city emblem is a stylized kanji 夕 Yu of Yubari in a black hexagon. The black diamond symbolizes coal industry. The flag of the town of Yuni is purple with mark. The town emblem was adopted on Dec 21st 1967 by Ordinance No 19 but there is no flag law. The blueish purple flag has a white town emblem in the center. The town emblem is a stylized katakana ユ Yu of Yuni. It represents an image of the peaceful town surrounded by peaks of Yubari and Mt. Maoi which richly makes a leap forward.